HomeGeneral News05/14 Links Pt2: The Privileged Palestinian "Refugees"; When Will the Palestinians Start Holding Hamas Accountable? ; Who gains from burning Gaza’s only fuel pipelines? 05/14 Links Pt2: The Privileged Palestinian "Refugees"; When Will the Palestinians Start Holding Hamas Accountable? ; Who gains from burning Gaza’s only fuel pipelines? Fifty-two Palestinians were killed Monday in violent clashes with Israeli forces along the Gaza Strip’s border with Israel, Palestinians said, in a burst of bloodshed that cast a cloud over Israel’s festive inauguration of the new US Embassy in Jerusalem. It was the deadliest day in Gaza since the devastating cross-border war between the territory’s Hamas rulers and Israel in 2014. Gaza’s Hamas-run health ministry said 52 Palestinians were killed and more than 1,2000 were wounded in the violence, amid the biggest riots and rallies in a weeks-long campaign of protests against Israel. The Israeli army said around 50,000 Gazans were demonstrating in 12 locations along the border. It said thousands more were gathered at points several hundred meters from the fence. At around 4 p.m., the time that the US was inaugurating its embassy in Jerusalem, military sources said Hamas-spurred groups were trying to breach the border at several spots along the Gaza fence. The army said three of those killed were trying to plant explosives at the border fence. In two separate incidents, IDF troops opened fire on gunmen who were trying to shoot them, Hadashot TV said. The army also said aircraft struck a Hamas post after gunmen there opened fire on troops. There were no injuries among the soldiers. Reports said the IAF also struck five targets in the Jabaliya area. Hundreds of Palestinians clashed with Israeli troops on the outskirts of Jerusalem and in other locations in the West Bank Monday in the hours leading up to the dedication ceremony for the new US Embassy in the capital. In addition to protesting the embassy move, Palestinians were marking the 70th anniversary of the Nakba, or “catastrophe,” of Israel’s creation in 1948. The rioting came as dozens of Palestinians were killed by Israeli security forces during violent protests on the Israel-Gaza border, among them several terror operatives. At the Qalandiya crossing, north of Jerusalem, hundreds were marching and throwing stones at Israeli soldiers, who responded with firing live bullets, tear gas and rubber-coated steel pellets. A second clash was reported between Jerusalem and Bethlehem, and there were further protests in the West Bank city of Hebron. There were no immediate reports of injuries. Israeli military aircraft dropped leaflets over the Gaza Strip early Monday morning warning Palestinians to keep away from the fence separating the coastal enclave from Israel, the IDF said, ahead of mass demonstrations slated for later in the day. 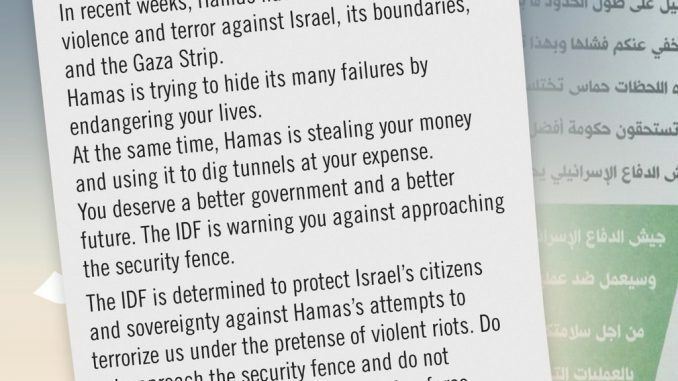 “A few minutes ago, IDF jets once again distributed leaflets warning against approaching the security fence, attempting to sabotage it or to carry out terror attacks,” the army’s spokesperson office tweeted. 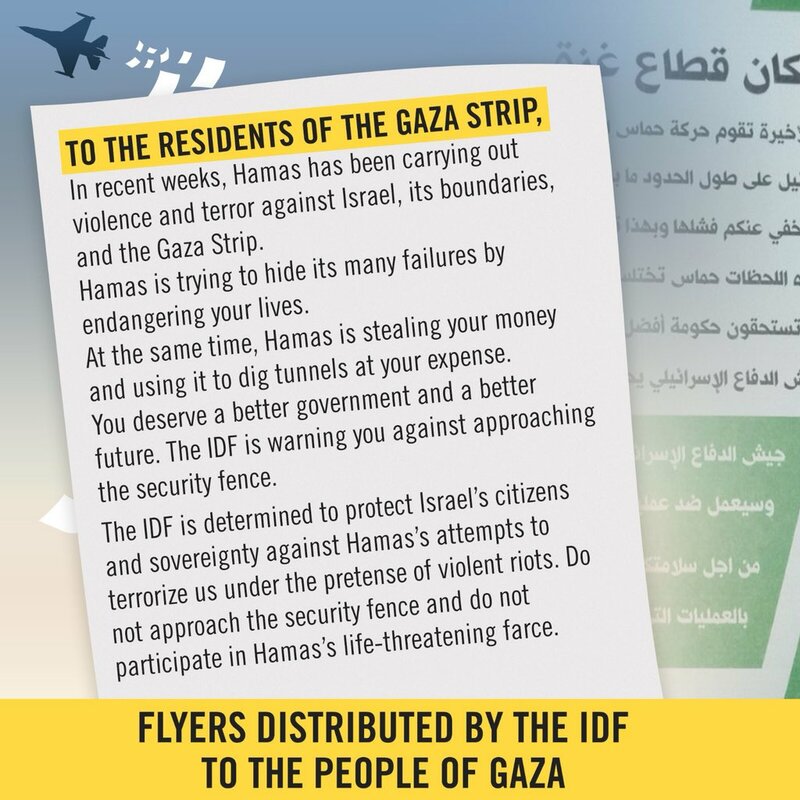 The Arabic leaflets also told residents of the coastal enclave that the Hamas terror group which rules the strip was endangering their lives. The message from Israel was that the people of Gaza deserve better. The last line was a strong warning to keep away from the border. “Do not approach the security fence and do not participate in Hamas’s life-threatening farce,” the army said. These massive refugee problems were handled by the International Refugee Organization (IRO), established by the U.N. General Assembly in December 1946 and succeeded in January 1951 by the High Commissioner’s Office for Refugees (UNHCR), which rapidly expanded its initial Eurocentric outlook to include refugees and displaced persons from all over the world. There was only one exception to this pattern: the Arab escapees of the 1948-49 war who received their own relief agency, the United Nations Relief for Palestine Refugees (UNRPR), set up in November 1948 and succeeded on May 1, 1950 by UNRWA. And while UNHCR was created on a shoestring annual budget of $300,000, UNRWA was established on the assumption that “the equivalent of approximately $33,700,000 will be required for direct relief and works programmes for the period 1 January to 31 December 1950.” In other words, the Palestinian refugees received 110 times the money allocated to the treatment of all other refugees throughout the world. Jim Geraghty: When Will the Palestinians Start Holding Hamas Accountable? At what point do the Palestinians start holding Hamas accountable for the decisions it makes? A desalinization plant would cost about $100 million and wastewater treatment options range in cost; as of 2013, Hamas’s budget was $700 million. But they spend a lot of that on rockets and arms instead of maintaining the basic services of a functioning society, such as water and sewage and electricity. How significant are those benefits, though? Bad publicity and international condemnations for Israel? Israeli leaders get denounced 20 times before breakfast. A lot of Europeans are always up for some rhetorical Israel-bashing, but how often do they really take action to improve life for Palestinians? A lot of people have died waiting for Western nations to react to outrages, both alleged or indisputable. The United States and Europe just watched so many people get killed in the Syrian civil war that they lost count of them, and that multi-year conflict created a refugee crisis so bad that it reached Europe, and they still intervened only minimally. 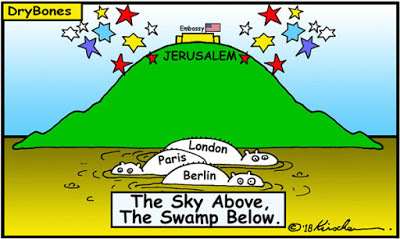 Just what does Hamas think the rest of the world is willing to do to Israel? British and other western media, led by the BBC, continue to sanitise what they so shamefully call “peaceful demonstrations” by the Arabs of Gaza at the border with Israel. In fact, these are attempted mass invasions of Israel using violent means including bombs, grenades and (grotesquely) flaming kites to set fire to Israeli farmland. If these mobs were to break through en masse as intended, no-one can be in the slightest doubt about the slaughter of Jews that would then follow. The scale of what Hamas has been planning for the culmination of all this on Tuesday and Wednesday (update: the IDF is warning this has all been brought forward to tomorrow and may involve an attempted massacre of Israeli civilians) has caused Israel to put itself onto a war footing in the south and call up Israeli reserves for duty. According to this report from the authoritative Meir Amit Intelligence and Terrorism Information Centre, Hamas hopes to bring hundreds of thousands of Arabs to the border to bring about “mass penetration into Israel” accompanied by “acts of violence and maybe even terrorist attacks exceeding what has been seen so far”. They are also inciting to mass violence the Arabs living in the disputed territories, and Israeli Arabs too. With the world’s attention focused on the US pull-out from the Iran deal (and, tomorrow, on the symbolic opening of the US embassy in Jerusalem to be attended by hundreds of dignitaries), the report observes: “a great number of casualties and the opening of new fronts of violent friction between the Israeli security forces and demonstrators in Judea and Samaria and other arenas may, from Hamas’s perspective, increase the media impact and return the Palestinian issue to the headlines. As Palestinian groups proclaim their intention to trigger violent confrontations to mark the opening of the US Embassy in Jerusalem on May 14 and on May 15 to commemorate 70 years since the 1948 invasion against the newly proclaimed State of Israel, NGO Monitor recommends that diplomats, journalists, and others treat NGO claims, reports, publications, statements, and other material with caution. The protests are part of Nakba Day, a national day of Palestinian mourning marking the “catastrophe” of Israel’s founding, commemorated every year on May 15, but this year brought forward a day due to the embassy opening. The National Committee for the Commemoration of the Nakba announced a protest march beginning at 11 a.m. in Ramallah which will head toward the Qalandiya checkpoint, on the outskirts of Jerusalem. At the same time demonstrations will be held in other cities in the West Bank, including Bethlehem, Hebron, Nablus and Jericho. On its Facebook page the committee told Palestinians their “presence is a national duty” in order to reject US President Donald Trump’s recognition of Jerusalem as Israel’s capital and the relocation of the embassy. “We call on the young people to clash with the occupation forces at points of conflict and checkpoints,” the committee said, according to a report in Haaretz. At the same time The High Follow-Up Committee for Arab Citizens of Israel called for demonstrations in Jerusalem to “raise our voice against US policy that supports Israeli occupation and settlements, in a desperate American-Israeli effort to kill all chances for the creation of an independent and sovereign Palestinian state on the 1967 borders with Jerusalem as its capital,” committee head Mohammad Barake said, according to a Ma’an news agency report. The protests are now set for Monday, to coincide with the move of the US Embassy from Tel Aviv to Jerusalem, and not on Tuesday’s Nakba Day, as was originally expected. The Israel Defense Forces expects over 100,000 Palestinians to take part in the mass demonstrations and potentially as many as 200,000, something that would indicate a major victory for the Hamas terrorist group, which rules Gaza and has co-opted for its own ends what were originally slated to be weeks of nonviolent protests. The army’s primary fear during the expected riots is that dozens or hundreds of Palestinians, including Hamas members, will manage to break through the Gaza security fence and wreak havoc in one of the Israeli communities on the other side, attacking residents, starting fires, and destroying buildings. The military believes Hamas will focus its energies on this style of mass, chaotic attack, but the IDF is also preparing for more direct armed combat, including attacks on troops along the border, or kidnappings of IDF soldiers, as has happened along the Gaza border in years past. Israel is bracing for hundreds of thousands of Palestinians to stage mass protests in both the West Bank and Gaza Strip on Monday as the United States inaugurates its controversial new embassy in Jerusalem. The protests against the embassy move on Monday are also taking place on the 70th anniversary of Israel’s founding, the day after which is mourned by Palestinians as the Nakba, or “catastrophe,” commemorating the more than 700,000 Palestinians who fled or were expelled in the 1948 war surrounding Israel’s creation. In the West Bank, protesters in Ramallah and El Bireh are set to march towards the Qalandiyah checkpoint near Jerusalem beginning at 11:00 a.m. local time, while protests are also planned in Bethlehem, Hebron, Nablus and Jericho. Who gains from burning Gaza’s only fuel pipelines? The Kerem Shalom Crossing is the main, often the only, passageway into the Gaza Strip. Each day, hundreds of trucks travel through it, bringing everything from medical supplies and building materials to pajamas and children’s toys into the beleaguered coastal enclave. There are two other crossings into Gaza, Erez and Rafah. But Erez is almost solely for pedestrians, and the Egyptian-controlled Rafah is kept closed the vast majority of the time. This leaves Kerem Shalom as the most important lifeline for Gaza, which has been subject to a strict blockade by both Israel and Egypt for the past 11 years in order to prevent terrorist groups from bringing weapons into the Strip. Yet just after 6:00 p.m. Friday at the tail end of that day’s mass “March of Return” protest, a group of some 200 Palestinians broke into the Gaza side of the crossing and set fire to the Strip’s only fuel terminal and a conveyor belt used for raw construction materials. Two conveyor belts which brought animal feed into Gaza were also wrecked, according to the deputy director of the crossing. On Saturday night, Israel announced it would be keeping the crossing closed as it assessed the damage and determined how to bring Kerem Shalom back online. The army said exceptions would be made for humanitarian goods. “Israel didn’t make this decision in order to punish anyone, there’s just no other way,” a senior officer in the Israeli military’s liaison unit to the Palestinians told reporters on Sunday. “And now, me and my commanders are breaking our heads trying to figure out how to get medicine into Gaza,” he said, speaking on condition of anonymity. A leading businessman said the Gaza Strip is rapidly running out of cooking gas, after a large crowd of Palestinian demonstrators destroyed parts of the only cargo crossing through which fuel and gas can enter the territory from Israel. Samir Hamada, head of the association of cooking gas vendors, said Sunday that Gaza’s 2 million residents consume about 350 tons of gas daily, but that only about 300 tons are still available at private sales outlets. He says the territory’s Hamas rulers ordered sales to stop to assess the shortage. Late Friday, a large crowd of Palestinians badly damaged a fuel and gas terminal and a conveyor belt at the Kerem Shalom crossing. Israel closed the crossing and said it would likely take weeks or months to repair the damage. The army said Saturday that its recommendation to shutter the crossing, which ordinarily sees hundreds of cargo-bearing trucks pass into Gaza each day, was approved by Defense Minister Avigdor Liberman. Friday’s vandalism at the crossing was a repeat of a similar incident on May 4, when rioters broke into the Palestinian side of the crossing and damaged pipelines carrying gas and oil into Gaza, which already suffers from a significant energy shortage. Iran is funding Hamas’s campaign to promote violence and attacks against Israel under the cover of mass demonstrations at the border, the Shin Bet security service said on Monday. Over the course of the past seven weeks of violent demonstrations along the Gaza border, in an event known collectively as the “March of Return,” Israeli forces have arrested a number of Palestinians, some of them Hamas members, who crossed the security fence into Israeli territory. Ahead of mass riots expected on Monday, the Shin Bet released the findings of its interrogations of those suspects, which the security service said showed the methods used by Hamas to destabilize the border area, breach the fence and try to carry out terror attacks inside Israeli territory. 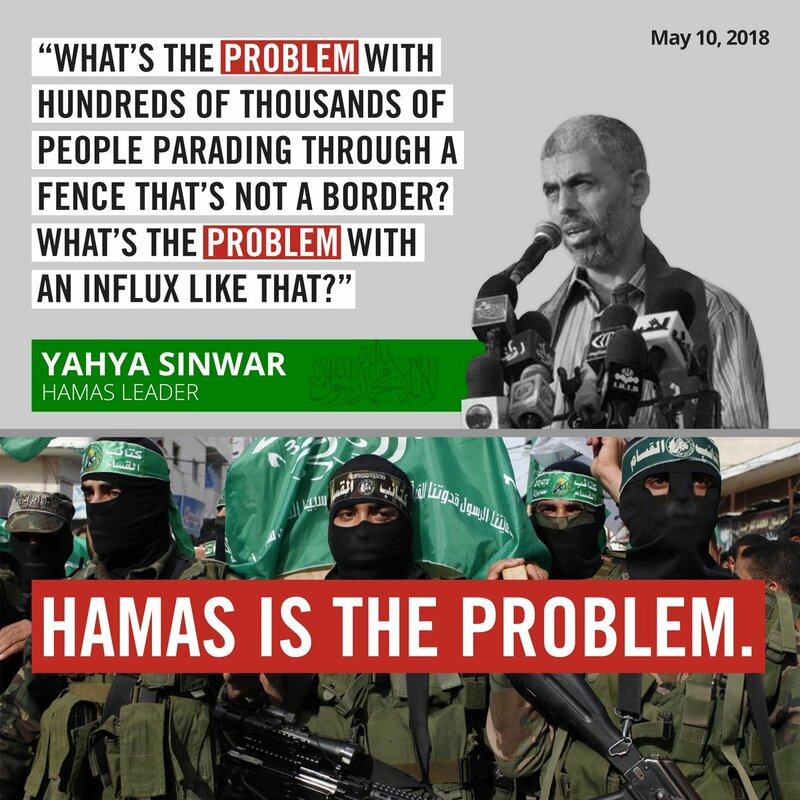 “From the information we have, it appears Hamas is encouraging and sending protesters to the border fence in order to carry out violent acts and damage security infrastructure. In addition, it was found that Iran is providing funding to Hamas in order for it to carry out these violent activities along the Gaza Strip’s border fence,” the Shin Bet said. The security service did not provide specific evidence of Iranian involvement. However, Hamas has maintained relations with the Islamic Republic and reportedly drawn significant funding from Tehran. I realize Eurovision dominated our posts yesterday, so time to move on to another competition show: Palestine’s Got Talent. Today’s entry is this young man, who demonstrates mad skillz despite being unable to walk properly. The United States is in the “late phases” of finalizing its Israeli-Palestinian peace plan that will be presented to both parties for consideration, according to a senior White House official, who discussed progress on the matter ahead of a massive celebration in Israel to open the new U.S. embassy in Jerusalem. Festivities surrounding the opening of the new U.S. embassy building in Jerusalem kicked off in “grand fashion” over the weekend and will spill into Monday afternoon when U.S, Israeli, and international diplomats gather to formally open the new embassy building, according to senior administration officials. The U.S. presidential delegation touched down in Israel Sunday afternoon and quickly entered into a series of celebrations and bilateral meetings with Israeli officials. At a dinner organized by the Friends of Zion Museum, U.S. Ambassador to Israel David Friedman and senior presidential adviser Jared Kushner, also the president’s son-in-law, were presented awards for their efforts to spearhead the embassy move. While security remains tight amid fears of possible violence by Palestinian protestors, U.S. officials said the mood around Jerusalem is celebratory, with “people out in the streets carrying American and Israeli flags,” according to one senior White House official who is in Israel for the embassy opening. Former US presidential candidate Michele Bachmann, who in 2015 appeared to call for intensified efforts to convert Jews to Christianity, on Sunday apologized for her past “ignorant” comments about the Jewish people. Speaking at a Knesset interfaith Bible study organized by Likud lawmaker Yehudah Glick and the Israel365 organization, the former Minnesota congresswoman spoke generally and declined to acknowledge directly what comments she was apologizing for. “Personally, I know that in ignorance… myself, I have stated things that I should not have said and I profoundly apologize and repent and ask forgiveness from Almighty God for my statements that, though said in ignorance, have brought pain,” she said. Bachmann, who ran for the Republican presidential nomination in 2012, also asked forgiveness for the “horrible and, yes, I would say, the arrogant way that Christians — I would include myself among them — have treated and regarded the Jewish people” throughout history. Following a visit to Israel in 2015, Bachmann told a right-wing radio station that an intensification of violence in the region signaled the return of Jesus, necessitating mass conversions. Dozens of activists from the Zionist organization Im Tirtzu demonstrated on Monday against the annual Nakba Day ceremony held by Arab and far-left students at Tel Aviv University. Im Tirtzu activists together with a number of wounded IDF veterans waved Israeli flags, chanted “Nakba Nonsense” and passed out flyers. The activists also brought a 12-by-6-foot sign reading “Nakba Nonsense“ and distributed books titled “The Jewish People’s Rights to the Land of Israel,” which, according to Im Tirtzu, details the legal rights of the Jewish people to the land of Israel under international law. Im Tirtzu CEO Matan Peleg said that the sole purpose of the Nakba is to undermine the existence of the State of Israel. “It is important to unapologetically call the Nakba what it is: nonsense,” added Peleg. Palestinian Media Watch has reported extensively on the PA and Fatah’s condemnation of the American recognition of Jerusalem as Israel’s capital and the embassy move. 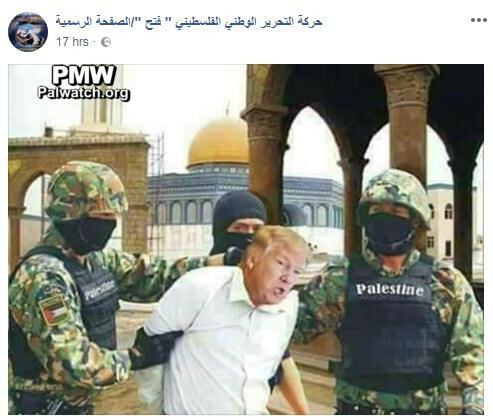 Another image posted by Fatah is a drawing of Palestinians responding with violence and protests surrounding Jerusalem. The image shows a woman wearing a hijab (religious headscarf), the lower part of which extends to form a wall. Above the wall are buildings and the Dome of the Rock. To the left of the Dome of the Rock are two masked Palestinian rioters wearing keffiyehs (Arab headdresses) and using slingshots, and to the right birds are seen flying. A keffiyeh pattern and Palestinian flag are seen in the background. At the bottom is the outline of masses of people demonstrating and waving Palestinian flags. International human rights organization the Simon Wiesenthal Center is considering the inclusion of three senior executives of the German Bank for Social Economy (BFS) on its list of the top ten worst cases of anti-Israel and antisemitic activity in 2018 because of the bank’s aggressive enabling of the BDS campaign targeting the Jewish state. “We condemn the leaders of any bank that continues to allow BFS to do business with those who work to damage and ultimately do away with the Jewish state,” Rabbi Abraham Cooper, the associate dean of the center, told The Jerusalem Post on Monday. “Today’s Germans are not responsible for the genocidal crimes of their ancestors but do have a moral obligation to do no harm to the Jewish people. “Those who choose to abet Israel’s enemies will be considered for the center’s 2018 top ten antisemitic/anti-Israel list,” said Cooper. The three BFS executives who may end up on the list are: Harald Schmitz, the chairman of the bank, and his two deputies, Oliver Luckner and Thomas Kahleis. Numerous Post media queries sent to Schmitz, Luckner and Kahleis were not returned. A representative for the Youth Forum of the German-Israeli friendship society in Heidelberg, told The Jerusalem Post on Friday that the forum submitted the anti-BDS proposal. “The student council said BDS is antisemitic and BDS groups and affiliated groups will not be supported with rooms or finances, ” said the representative. The anti-BDS resolution was supported by the student council’s political education department and the Union of Jewish Students in Baden, said the Youth Forum representative. The university is located in the town of Heidelberg in the southwestern state of Baden-Württemberg and was founded in 1386 by a decree of Pope Urban VI, marking it as the oldest institution of higher learning in Germany. The student council decision to ban BDS will cover the over 30,000 students who attend the university. The Trump administration’s decision to move the U.S. embassy in Israel to Jerusalem was about “pleasing the people who finance the GOP,” an MSNBC guest said on Monday. President Donald Trump recognized Jerusalem as Israel’s capital in a historic gesture last December, and the U.S. Embassy in Israel officially opened in Jerusalem on Monday on the 70th anniversary of Israel’s independence. The decision has led to mass protests and violence in the Gaza Strip, and journalist Bobby Ghosh said on MSNBC that the move was not part of any peace process. Any invocation of the word “peace” by Trump, he said, made many Arabs wince. Early this month, Alibaba CEO Jack Ma visited the Western Wall, donning a kippah and honoring the holy Jewish site, a remnant of the Jewish Temple compound. On what basis, then, did CNN Arabic refer to the site using its Muslim name, “Al Buraq wall”? Use of an Islamic name in context of a visit intended to honor the site’s special status in Judaism is clearly inappropriate and misleading. Furthermore, not only does CNN in English not use the term “Al-Buraq” wall to refer to the Western Wall, but CAMERA Arabic has confirmed that CNN Arabic has not used this misleading term in the past. In honor of Israel’s 70th anniversary, 5,000 Israeli flags signed by 200,000 well-wishers from across the world will be placed in a time capsule at Jerusalem’s Ammunition Hill historic site to be opened in 2048 on Israel’s centenary. At least 200 of the blue-and-white banners will hang from poles in the center’s main hall for several months starting on Jerusalem Day (May 13 this year) before joining the others in the capsule. They’ll be preserved in special envelopes and catalogued so signers can find their flags easily in 30 years’ time. The signatures, blessings and wishes of children, soldiers, cultural and spiritual leaders, government officials, ambassadors and others from Israel as well as New Delhi, Rome, San Francisco, Bucharest, Copenhagen, San Paolo, Abidjan, Miami, Serbia, Moscow, Seoul, Tokyo and other citiesare inscribed in languages ranging from Portuguese to Arabic. One school group came from Los Gatos, California, to hand-deliver their flag. In Florida, 4,000 students marched with 30 of the signed flags on Israeli Independence Day before sending them to Ammunition Hill. Many other groups sent pictures and videos of the signing event. A US Army veteran with post-traumatic stress disorder visiting Israel with Heroes to Heroes wrote on the group’s flag, “Thank you, I chose life” – referring to the high rate of suicide among American war veterans and the healing power of his experience touring with Israeli counterparts.